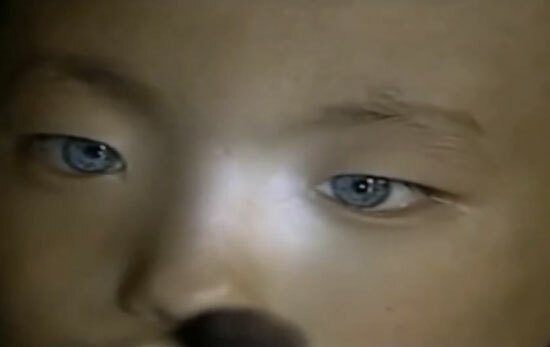 I saw some nonsense today about a Chinese boy born with blue eyes. They claim he can read in dim light and has to squint in bright light. He must be a mutant with super powers! Um, you guys? EVERYBODY with blue eyes can see better in low light than brown eyed people. The irises of blue eyes are more translucent and admit more light. Brown eyes are a result of light-blocking pigment in the irises. Blue eyes result from a gene change that doesn't tell the body to make as much of that pigment. Because he lives in a place where brown eyes are predominant the other people probably don't know anything about blue eyes. He's not an alien, or an X-man any more than I am. Yes, it is a mutation that the child of two brown eyed people would have blue eyes. But it's not a NEW mutation (Read about it here). Obviously this random genetic change happened before, was replicated through reproduction and enhanced with natural selection until there are whole groups of people where blue eyes are predominant. It happens to be an advantage in a place with low light to have blue eyes and the light skin that often goes with them. The gene to make the body create less pigment in the iris of the eye usually turns down the amount in the skin as well. Blue-eyed, light skinned people like me can synthesize the Vitamin D they need with less sun exposure than people with darker eyes and skin. Why is the media giving him super powers? They need to get the poor kid some sunglasses and a hat, not make him a spectacle. I feel awful for Nong Youhui. I also feel awful that people are so SILLY! Why would they say he has the eyes of a cat? They're normal blue people eyes! And it gets repeated by more people that want to believe in X-men type powers. Now you just stop that, all of you. This is ridiculous.